The bomb damages inflicted on Tirpitz showed that it was not particularly vulnerable to bombs compared to contemporary designs. Yes and no. The combination of the 50mm weather deck plus two decks worth of spacing to reach the panzerdeck makes penetration to the vitals unlikely. OTOH, given how low the panzerdeck sits in the ship, you're yielding a lot of volume to any bomb that can penetrate the weather deck. In the case a 1000lbs SAP bomb that carries a few hundred pounds worth of high explosives, it would make a pretty big mess in that space, and the shock of the blast is liable to affect all sorts of sensitive bits, even if they are below the panzerdeck. This seems to miss that the German scheme and the alternative USN/RN/IJN scheme protects roughly the same citadel volume. The difference is that the German armoured raft is lower and longer. Thus a semi-armour piercing bomb that just misses the armoured raft of South Dakota forward or aft may explode deep in the ship and cause flooding whilst the equivalent hit on Bismarck may explode above the main armoured deck. Obviously both hits cause damage but the hit on Bismarck is less likely to cause a speed reduction or contribute directly to sinking the ship. The weakness of the German scheme is that the area of armoured deck (and the length of the citadel) is increased, so the total thickness has to be reduced. Thus South Dakota has a 1.5" weather deck and a 5" on 1" main deck with 5/8" splinter armour below for a total of 8.125" (over 205 mm) over all the citadel. Tirpitz has an 80 mm weather deck above a 100 mm main deck over the magazines but only a 50 mm weather deck above an 80 mm main deck above the machinery (the intermediate 6mm deck would give almost no extra protection). Although yaw may make the 50 mm plus 80 deck effective against shells, the attack on Scharnhorst off La Pallice on 24th July 1941 seems to have convinced the KM that it was ineffective against armour piercing bombs dropped from medium altitude. Scharnhorst was hit by five bombs of which two 1000 lb AP bombs hit within the citadel and both penetrated all the decks. However, none of the three 1000 lb bombs which hit exploded. https://www.scharnhorst-class.dk/scharn ... brest.html gives the height from which the bombs were dropped as 3.000 to 3.700 meters (10-12,000 feet), possibly from German records, whilst http://www.archieraf.co.uk/archie/l9512 ... y1941.html reports 14,500 feet. In 1944, Tirpitz was hit by several 1,600 lb AP bombs dropped by dive bombers from lower altitude and only one pierced the 80 mm armour deck but again did not explode. There is a further small weakness in the German scheme in that bombs exploding on the scarp may push the main belt outwards. One of the two 500 lb bomb hits on Scharnhorst had this effect and https://www.scharnhorst-class.dk/scharn ... brest.html has "The side-armor plating was deflected outboard about 200 mm, and a small hole was torn in it". Heavier bomb hits on Hyuga and Ise in 1945 showed this problem more obviously. However, a strong weather deck does have advantages against bombs dropped from low altitude as bombs that penetrate do not kill the anti-aircraft gunners and it is interesting that the Montana design had a 2.25" weather deck. Last edited by Steve-M on Sat Jul 28, 2018 4:26 pm, edited 1 time in total. This seems to miss that the German scheme and the alternative USN/RN/IJN scheme protects roughly the same citadel volume. The difference is that the German armoured raft is lower and longer. Thus a semi-armour piercing bomb that just misses the armoured raft of South Dakota forward or aft may explode deep in the ship and cause flooding whilst the equivalent hit on Bismarck may explode above the main armoured deck. To be clear, I'm not holding that a pure AON scheme that totally sacrifices any sort of protection on the ends as being a perfect design either. In any case, while the German scheme is lower and longer, it's not significantly(if any) lighter for a given length, which is a problem if you have to adhere to tonnage limits. The main belt can't be substantially reduced in height without exposing the scarp; an upper belt was needed to cover the relatively thin panzerdeck, a deck that slopes down is heavier due to its geometry relative to a flat deck, etc. The payoff to this arrangement was clear, but there is no free lunch. Obviously both hits cause damage but the hit on Bismarck is less likely to cause a speed reduction or contribute directly to sinking the ship....There is a further small weakness in the German scheme in that bombs exploding on the scarp may push the main belt outwards. One of the two 500 lb bomb hits on Scharnhorst had this effect and https://www.scharnhorst-class.dk/scharn ... brest.html has "The side-armor plating was deflected outboard about 200 mm, and a small hole was torn in it". Heavier bomb hits on Hyuga and Ise in 1945 showed this problem more obviously. This seems somewhat contradictory, no? That even a 500 pound bomb is able to push out the armored belt, affecting watertightness and speed, and compromising the integrity of the citadel on top of that seems problematic to me. Do you really want that vulnerability when your fortune teller has advised you that you will be facing Kido Butai? The other 227 kg (500 lb) bomb fell forward of the after turret, to starboard, 3 meters from the deck edge; it penetrated two decks and exploded on the main armor deck, where it made a small hole. Several frames were holed by splinters, and the connection at the top of the torpedo bulkhead was damaged. The penetrated decks bulged from the explosion and were holed by splinters. Some flooding occurred in the outboard spaces. Heating, potable, and plumbing piping under the battery and middle decks was damaged. The ammunition hoists for the 37 mm guns were put out of action, although the ammunition was not affected. What happens if that hit happens over a boiler room, with no standoff distance between the panzerdeck and that space? How does that contrast with SoDak that you mentioned, where the main armor deck is thicker, higher up, and backed by a splinter deck? How much worse does it get with a 1000 pound SAP bomb blowing on top of the panzerdeck? I agree that bombs seem a serious threat to the German armour scheme. After the attack on Scharnhorst, the H39 design was revised to resist bombs resulting in the H41 paper design. This strengthened the scarp from 150 mm to 175 mm and replaced the 120 mm main deck by one of 200 mm. It was also proposed to bore out the guns to 42 cm. The cost was a bigger ship and as the power remained the same, the speed anticipated fell from 30 knots to 28 knots. However, notice that the long citadel of the German scheme may reduce the threat of torpedoes at Darwin and that my fortune teller also predicts an encounter with Tirpitz in Arctic darkness and thus almost certainly at quite short range, shorter that is than the inner limit of the immune zone calculated for most AoN battleships. Freedonia has actually spent more resources investigating revised versions of the Yamato design than any other in the hope that the thick main armour deck can resist bombs if it is constructed of the best quality homogeneous armour available. Certainly we are attracted to the Yamato hull form but we have recently become seriously divided over a drawing produced by our fortune teller from this mysterious internet http://www.maritimequest.com/warship_di ... cvn_68.jpg. Some of our designers think that this design's dramatic transom could add a knot to a battleship's speed whilst allowing two well separated rudders and giving enough buoyancy to allow us to armour separate rudder motor compartments to the level of main gun turrets. Unfortunately others insist that this is some short range design for local defence as resistance at low speed will be much greater than that of a cruiser stern with a single rudder. 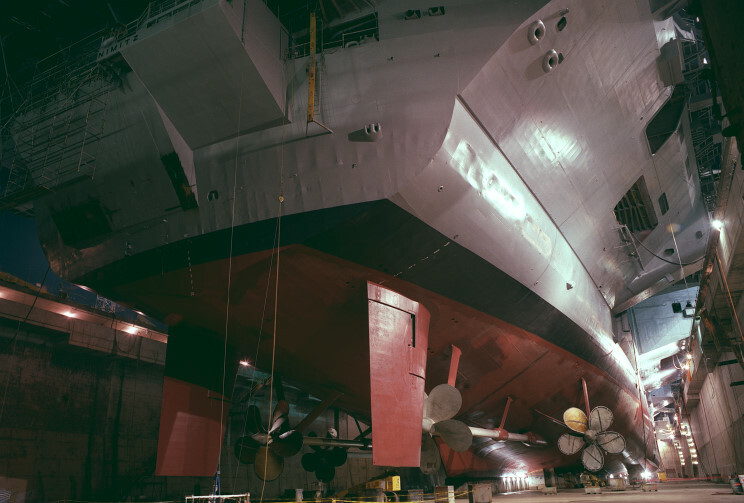 The max effective thickness of the South Dakota's deck protection was 145mm. Roughly the same as Scharnhorst's. Depends on how committed the Japanese are to sinking you. Withstanding sustained aerial attacks from four carriers is a pretty tall order, regardless of how tough your ship is. and that my fortune teller also predicts an encounter with Tirpitz in Arctic darkness and thus almost certainly at quite short range, shorter that is than the inner limit of the immune zone calculated for most AoN battleships. What's your goal for this engagement? Realistically, the Germans aren't interested in risking Tirpitz to a nighttime knife fight with another modern battleship. Do you simply want a ship that isn't going to blow up like Hood, and hope to inflict some damage that may slow Tirpitz down as it escapes? Or are you only looking at an uber-battleship that out-guns, out-armors, and out-runs Tirpitz, and will sink her without breaking a sweat? If its the former, things can be a lot more in the realm of reality vs fantasy. Barring a magazine hit, it's pretty hard to sink a BB by gunfire alone. Simply following British practice of placing the magazines below the shell rooms (with 40mm of D-steel above the magazines in the KGVs) provides a lot of protection in this respect against short ranged, flat trajectory fire. If it's the latter, I'd suggest instead of building a super-battleship, build a more modest BB or two plus a supporting cast, and effectively do to Tirpitz what the British did to Scharnhorst at North Cape. I'd also opine that such a battle group would be more likely to survive than lone a super-battleship at Darwin. It is around 1936 and I have been appointed as Navy Minister by Freedonia. We are planning to build a battleship or class of battleships. As Freedonia has reasonably good relations with all the World's major naval powers, we are able to use technology from any country. We even have a few engineers who can test, modify or develop technologies although they don't have too many original ideas. I need your advice on what sort of ships we should build. Unfortunately, for reasons of security, I have to be vague about our strategic plans, the extent of our budget, the size of our dry docks and even the maximum draft of ships that can use our naval bases. This is indeed very vague. You don't say anything about Freedonia itself or why it would want a fleet of battleships. Without the geopolitical background it is difficult to answer the question as the strategic and tactical purposes of such ships cannot be defined. Firstly, I must apologise that Freedonia's Navy Ministry has been on holiday during August. On reflection, this sort of inefficiency is probably why Freedonia is not normally listed amongst the Great Powers. Sadly, there is still little clarity on the strategic role for which our battleships are to be designed. Statements in our Cabinet such as "to give us a seat at the top table" seem to illustrate our lack of ideas. However, the delay has allowed several of our officers to return from missions to the Naval Great Powers. This is a very mixed blessing as they have returned with strongly held opinions which have kept the whole ministry in fierce and confused debate. This extended to things that I had assumed were relatively simple, such as shells, which I had expected could be designed and manufactured in Freedonia without too much trouble as I had believed that these were just large pieces of steel or improved cannon balls. Unfortunately, it appears that shells are in fact quite complex. For example, all the shell designs contain an explosive. However, listing from the most stable and weakest explosive to the least stable but most powerful, the Americans use ammonium picrate, the Germans and Italians use TNT, the British use a mixture of picric acid and dinitrophenol whilst the Japanese use tri-nitro-aniso (methylated picric acid). It turns out that users of the more powerful explosives must wrap the burster charge in padding, leaving less space for the charge. I told the designers to calculate what will give the biggest bang but they replied that to know how much protection the charge requires, we need to know the shell's velocity when it hits heavy armour. The velocity is part of a set of much more difficult choices as we design our shells and I desperately hope that you can give me good advice to resolve a debate mostly driven by four returning officers. The officer sent to liaise with the RN argues that shells mostly do their damage by exploding and that shell design should accept some reduction in penetration by increasing the burster charge and that preventing effects such as "back slap" from damaging the fuze is critical. His argument is that enemy battleships have many vulnerabilities that are not protected by thick armour and that the explosion of shells with large burster charges will degrade the enemy at ranges where armour penetration is improbable and allow us to close to decisive range. Thus he wants a short delay to ensure that a deflected shell still explodes within the target and a pointed nose to penetrate at close range. Such British influenced views have been mocked by two officers sent to Germany and to America who agree that the penetration of the enemy's citadel is critical. Unfortunately, they disagree on how the citadel should be penetrated, with German ideas focused on penetrating the facehardened belts and the Americans focused on penetrating homogeneous decks. Thus the Germans believe in firing moderate weight shells at relatively high velocity because penetration of facehardened armour depends mostly on velocity whilst the Americans prefer a very heavy shell fired at lower velocity and thus at a higher angle to optimise the penetration of decks. Of course, once one takes the basic decision on how to penetrate the citadel, other choices follow. The Americans advocate a small bursting charge to give a heavier and stronger shell. They also advocate a very blunt nosed shell because that helps penetration at very oblique angles. The Germans meanwhile have chosen a moderately pointed shell, somewhere between the British and American choices, optimised for attacking facehardened armour at 30 to 45 degrees. As penetrating facehardened armour is very much easier with a hard cap in place, the Germans have developed methods of attaching the cap with high temperature solder without weakening the shell body which, combined with the mildly pointed shape, means that quite thick armour is required to detach the cap. Of course, using the German solder should keep a cap attached to any other moderately pointed shell. The officer reporting the German views also pointed out that high muzzle velocity gives a higher hit probability because of the increased danger space and the shorter time of flight whilst his USN influenced opponent points out that the heavier shell will retain velocity better and may even have a higher impact velocity beyond somewhere between 20,000 and 24,000 yards. However, his strongest argument may be that ships can be angled to strengthen their belt but not their deck. If these disputes were not enough, an officer returning from Japan reports that shells can be optimised for travelling significant distances underwater which could roughly double the number of hits. The shells must have a rather flat nose when underwater and this is achieved by having an easily detachable windshield and cap head. There are two obvious weaknesses quickly pointed out by his rivals. The easy removal of the cap head may give less protection of the shell nose as it hits facehardened armour and the fuse delay must be very long if shells are not to explode before they can hit deep underwater, which means for normal hits without long underwater trajectories that only shells greatly slowed by hitting thick armour will explode within the target. Given those weaknesses, one would have to be sure of the advantages before adopting such a design and opponents allege that the Japanese are essentially fooling themselves that they can achieve reliable underwater trajectories. I attempted to resolve this by asking my favourite fortune teller, whose crystal ball communicates with something called "the Internet". Alas, she told me that Japanese battleships fired so few AP shells at enemy ships that no conclusions could be drawn. Cruisers fired more shells but, as shells lose of velocity depended on the number of calibres travelled, one might expect fewer underwater hits from cruisers. The fortune teller reported only three underwater hits compared to many more above water hits and some reason to believe that shorter delay fuses might sometimes have caused more damage, for example to USS Denver. I have noticed that one can try to combine different nation's technologies. If we believe both the German's claims of penetration of thick armour at moderate obliquity and the Japanese belief that their shells can maintain velocity and direction after falling 30 to 60 metres short of the target, it becomes attractive to fit a flat cap nose, probably achieved via an easily detachable cap head, using a high temperature solder to a sheath hardened shell body almost identical to that of a German shell. The necessary difference is the use of a Japanese 0.4 second delay fuse (Type 13, ideally mod 5). If it does not weaken the shell, we might also get advice from a British company, Hadfield, on the design of the base plug as 0.4 seconds gives plenty of time for a shell yawed by passing through armour to encounter other structures. The idea is to produce a diving shell which is also very effective against belt armour and fairly effective against decks. To illustrate that the overall dimensions and weigh are rather similar, we can compare a Japanese Type 91 41 cm shell with a German 40.6 cm shell. The German shell is slightly longer at 178.6 cm against 173.85 cm and slightly heavier at 1,030 kg against 1,020 kg. The German cap weighed 164.7 kg and the windshield 12.3 kg whilst the Japanese cap, cap head and windshield together weighed 162.4 kg. Thus the shell bodies are of very similar weight and shape. The German shell contained a bursting charge of 24.2 kg compared to only 14.89 kg in the Japanese shell, which may relate to the need to cushion shocks to the less stable TNA (note that the German TNT may have been desensitized by mixing it with beeswax) as well as a slightly larger and heavier Japanese fuse weighing around 1.3 kg. However, as the Japanese shell contains only a small charge, it does seem futile to put much faith in a mining action against battleships, although clearly a converted tanker could be crippled. Unfortunately, the optimal delay is not obvious. If we believe the Japanese statements that a Type 91 shell travels in a roughly straight line and loses half its velocity over one hundred calibers, we have a strange puzzle as hits, as opposed to mining effects, require less than 0.15 seconds at angles of fall such as 15 degrees. Even at an angle of fall of 10 degrees, assuming that ricochet can be avoided, 0.2 seconds would be sufficient. Thus the IJN appears to have tried to design for straight underwater trajectories but used a delay anticipating an upward curve. Having gone into a long discussion on shells we have digressed further from the wider picture outlined in my previous post - what is the purpose of the ships, what are the strategic requirements, who is the enemy etc. I think it unwise to design a shell, or the entire battleship, around a possible but unlikely event. Particularly when there is a trade off of performance during far more likely events. It is better to bias the trade offs toward the likely events. Consistent underwater hits are a possibility but rather unlikely. Indeed some posters here with more knowledgeable than myself have commented that such underwater hits are extremely unlikely. Consistently scoring hits at plus 30,000 yards are a possible but unlikely event. The most important factors for obtaining deck penetration are not the size and weight of the shell. More important are the striking angle and the shape of the shell head, among a range of similar caliber shells. Too pointed and the shell will likely scoop. The trade off is more penetration at or near the normal. An unlikely event. Across a fairly wide range of battleship caliber shells and weights, the angle of fall where the shell can penetrate about 5" of deck armour is about 28 degrees. Perhaps counter intuitively a slightly lighter shell will obtain a steeper angle of fall before the range becomes so great that a hit becomes unlikely. This is because the lighter shell has less momentum down range. The heavier shell loses less speed per yardage traveled. The advantages of a lighter, initially faster, shell, is that it has higher velocity when it is likely to encounter vertical armour, and has a steeper angle of fall at long range, but before the range becomes too extreme. Battle ranges of more than 30,000 yards are an unlikely event. Indeed it is likely that the battle range will be less than 25,000 yards during WW2. German research revealed that a shorter shell is more likely to penetrate intact. A longer, thereby heavier shell, is less likely to penetrate in a fit state to burst. A longer shell is also more likely to base slap. However, German research also revealed that a larger, heavier cap, improves penetration performance against heavy armour. But once the cap is eventually removed, there is a greater loss of mass, and therefore kinetic energy, with a larger cap. The cap staying on after encountering much resistance is unlikely. Making a cap that stays on once it encounters heavy resistance is an intractable problem. Everybody tried just about everything, and there was no truly successful solution to the problem. However, a more pointed shell head was more likely to retain its cap longer. Trade offs and more trade offs.